They say necessity is the mother of invention! Well that's clearly evident in this "Vanity Case" design for loose powder. 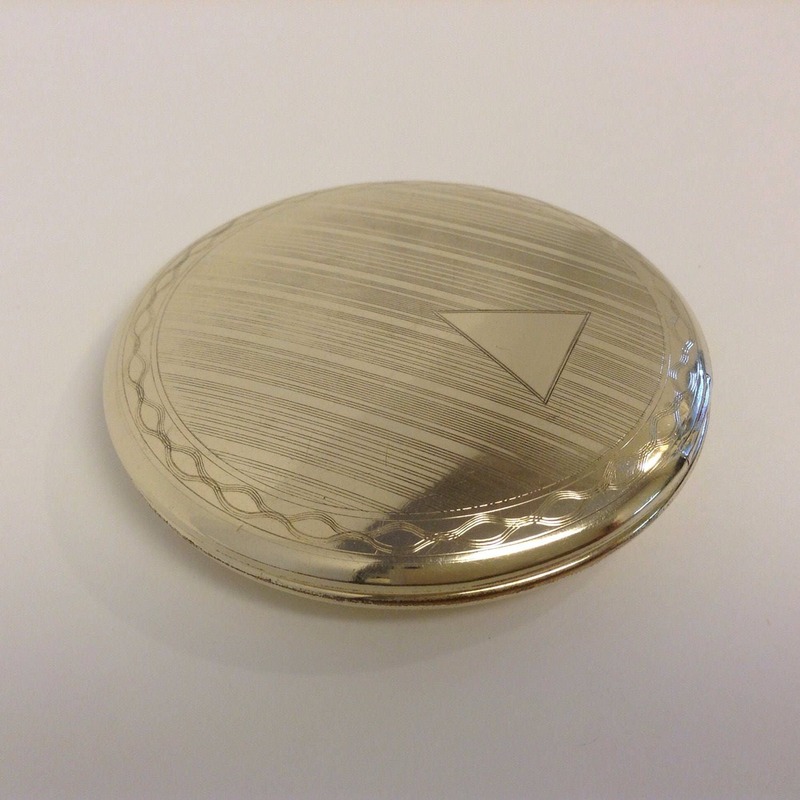 Invented and patented in 1925 by Herbert D. Hough of the Wightman & Hough Co, this vanity case offers a clean dispensing arrangement for loose face powder. The loose powder is placed in a well and covered with a metal lid. This lid is equipped with flap valves which are normally closed. By pressing the center of the lid inward, the flap valves open - forcing the loose powder out and in contact with the puff - which rests on the top of the lid. The engraved Art Deco detail on the outside top of the compact is fabulous - futuristic, weaved curves; stylish, spaced geometric bars and a blank, triangular-shaped inset perfect for your monogram. This "almost antique" compact is in beautiful condition considering its age and function. The hinge is secure; the lid closes firmly; the mirror is clear and the flap valve lid is intact. The piece measures 2 3/4" in diameter and is a 1/2" thick. Although unmarked, I believe the piece to be fine rolled gold plate. A bit of the loose powder found with the piece is now in a small bag - which will be included. There is no puff. The piece is dent-free with one small nick on the rim (see photo four at 4 o'clock) and two tiny pin-point dings - one to the front (which is so small I could not photograph); the other to the back (see photo five at 6 o'clock). There are surface scratches throughout from wear and use, but nothing that seriously detracts, and frankly add to the patina and character of the compact. There is some scattered discoloration to the inside metal. This piece is also marked - PAT. APLD. FOR - on both the mirror frame and the flap valve lid. A pretty and pretty amazing piece of early technology! Please excuse the reflection in the photos. Item price includes US Postal Service shipping with Insurance and / or Delivery Confirmation services. Beautiful set sent quickly and professionally packed. Everything got here safely! Love it!!! These are amazing and great condition! I have no doubt this gift will be a hit. Thanks so much! In flawless condition. Beautiful print by Susan Hunt Wulkowicz, nicely matted and framed. Arrived in two days, with personal note. Great addition to our collection. Thank you so much! All South Carolina residents pay Sales Tax of 6%. The item in the listing is the item that you will receive. Antique and vintage items may show wear and imperfection consistent with age and use. We do our best to accurately describe each item and detail any and all visible flaws. Please read through the item description and make sure to view all photographs as these are also an integral part of the description. We will always include measurements. Please check these before purchase. If you are unsure of an item's condition or have specific questions not addressed in the listing, please ask for more information or photos prior to purchase. All vintage and antique treasures are sold AS IS and are not returnable. We do not refund or exchange for buyer’s remorse. All sales are final. Antiques on Church may at times reuse packing materials and boxes. Every effort will be made to package your items safely and carefully. Please make sure your address on Etsy and PayPal are correct as this is where your package will be shipped - unless you specify otherwise. Shipping and handling has been included in the purchase price. Shipping is via the US Postal Service First-Class or Priority Mail services. All shipments include Insurance and/or Delivery Confirmation services. If your order arrives damaged, please let us know promptly so that an insurance claim can be initiated. Photos of the damaged item, as well as photos of the packaging materials as they appeared when the box was unpacked will be required to file an insurance claim and for reimbursement of any item damaged in transit. As with the nature of any antique / vintage item, there may be signs of past use or wear. We do our best to photograph and list any imperfections in an individual item's listing details, but please keep in mind that the majority of what we sell has been previously owned and used. We strive to deliver high quality items in good functional, usable, working condition, but our antique / vintage items are all sold on an AS IS basis. We thoroughly inspect and research to accurately represent our antique and vintage items; but in some cases, the information we provide about an item's age or origin cannot be guaranteed. Any errors made are unintentional with no thought to mislead or deceive. As all individual item prices include shipping, handling and insurance, please convo us when purchasing multiple items - we will combine item weight and adjust the total shipping cost to maximize savings for you. We appreciate positive feedback - let us know if you're pleased with your item(s). Thank you for your business and for visiting Antiques on Church.